Jack Baldwin (right) in conversation with new Posh manager Graham Westley at Norwich. Photo: Joe Dent/theposh.com. Peterborough United central defender Jack Baldwin continued his recovery from long-term injury with a 58-minute run-out for the reserves yesterday (September 22). 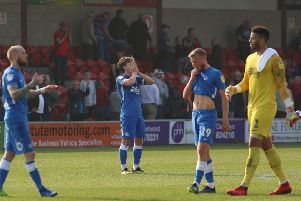 Posh went down 3-1 at the Canaries training base with Kyle Vassell briefly bringing his side back into contention with a goal in the second-half to make it 2-1. Andrew Fox, who has returned to the club after a month on loan at National League side Kidderminster, Kieran Sadlier, Alex Davey, Jack Collison and Harry Anderson all completed 90 minutes. Posh: Henry, Fox, Baldwin (sub Maslen-Jones), Davey, Adebayo-Rowling, Collison, Sadlier, Anderson, Da Silva Lopes, Vassell, Gormley (sub Lee). Left-back Callum Elder’s loan to Posh from Leicester City has been extended until January.